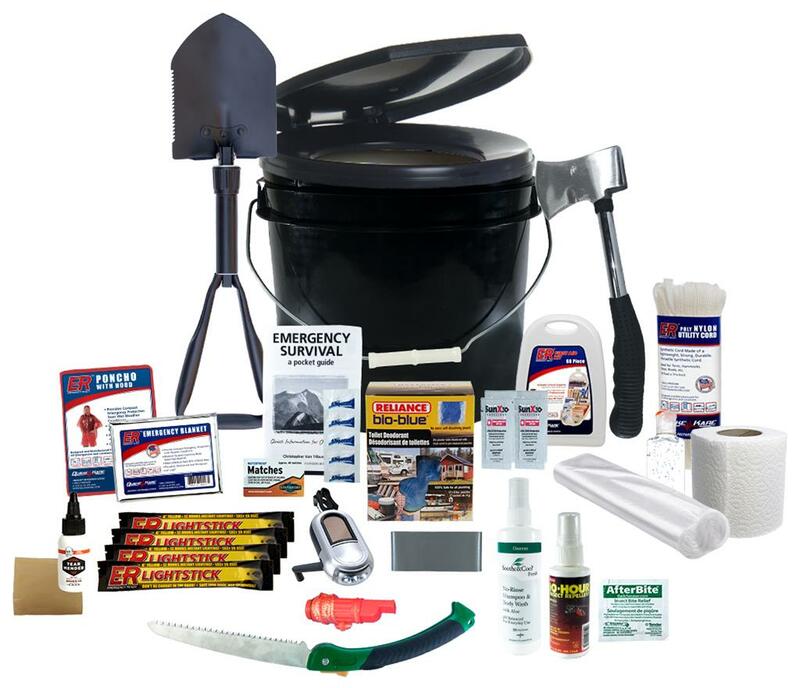 This compact kit includes the necessary supplies needed for a successful and safe camping trip including fire starters, mylar blankets, ponchos, first aid supplies, portable tools, bug repellant, toilet paper and much more. Camping is a fun, enjoyable experience but it can quickly turn stressful or even dangerous without the proper supplies or equipment. Rain dampened fire starters, a sudden injury or burnt out flashlight could hamper your experience in the outdoors. The ER™ Camping Survival Kit ensures you have the supplies you need when you need them. The Kit limits the stress of preparing for a camping trip by including tools and supplies to help you overcome common contingencies that could occur during your trip. Supplies include a fire starter with waterproof matches, Mylar blankets and ponchos for inclement weather, first aid supplies, a toilet seat and bucket for portable sanitation use, versatile duct tape, a fabric, leather and vinyl repair kit, utility tools including a shovel and saw and basic hygiene supplies. The supplies are packaged in a portable, water-resistant bucket that can easily be thrown into the back of a car or camper. The bucket can also be used to store water or for emergency sanitation purposes. The Fabric, Leather and Vinyl Repair Kit includes Tear Mender Adhesive and Vinyl Mender Patches for quick, permanent repairs on tents, tarps, hiking boots, packs and clothing. Camp with peace of mind knowing you are prepared for the unexpected.